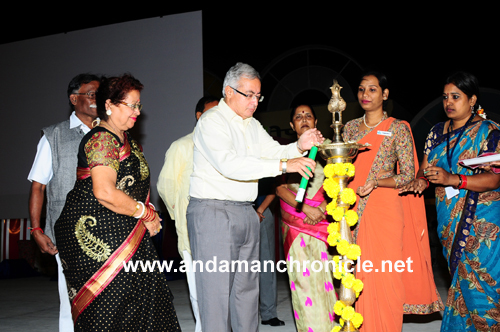 Port Blair, Jan 14: The much longed for ten-day long Island Tourism Festival (ITF) - 2014 began on 14th Jan. 2014 at the ITF Grounds, Port Blair. The Festival was inaugurated by the Chief Secretary, Anand Prakash by lighting of the traditional lamp in presence of the Member of Parliament, Bishnu Pada Ray and other dignitaries. On the occasion, Anand Prakash read out the message of the Lt. Governor AK Singh who had to suddenly leave for New Delhi on account of the sad demise of his sister. The Lt. Governor however conveyed his best wishes to the Islanders on the occasion of the Festival. He has also assured to reach by the last leg of the festival. Addressing the gathering on the occasion, the Chief Secretary appreciated the Tourism Department for organising this annual event and hoped that the 10-day event will surely entertain the islanders and the tourists as well. In his brief speech, the Member of Parliament, Bishnu Pada Ray expressed his happiness over the conduct of the annual event and said that the islanders will able to witness the performances of the artistes starting from Kashmir to Kanyakumari and these islands as well during the fortnight. Organized under the aegis of Tourism Department of the A&N Administration, the festival aims at showcasing the rich cultural heritage of the Islands. The enthralling performances by local as well as artists from mainland dressed in colourful costumes was the highlight of the opening ceremony. 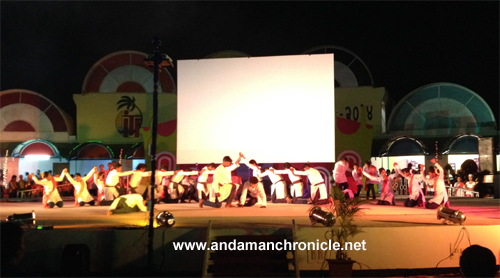 The cultural programme started with an impressive welcome song presented by the artistes of Sur – Saptak. Besides mesmerizing performances by Jashne Kashmir, artists of South Zone Cultural Centre (SZCC), Chennai and Eastern Zone Cultural Centre (EZCC), Virasast- a multimedia presentation by the artistes of A&N Islands depicting the composite culture, unique blend of our cultural traditions and spirit of ‘unity in diversity’ prevailing in these islands left the audience spellbound. The splendid display of fireworks that lit the night sky, added colour to the inaugural ceremony. Informing about the 10 -day extravangza, the Director Tourism, Shri Viswakannan stated that the major attractions of this year’s mega event includes performances by eminent artists viz. Padmashree Pandit Vishwa Mohan Bhatt (Mohan Veena), dance presentation by renowned dancer and film actress, Ms. Shamna Kassim, performance by well known Indian Percussionist Shivamani and a musical programme by well known artists Ms. Shruti Rane, singer & ‘Rerum’ a well known band from New Delhi. Cultural programmes will also be held in outer islands. Shri Viswakannan also proposed the vote of thanks. Today’s inaugural function was telecast live all over the world by DD Bharti. Among others, the function was also attended by the Chairperson PBMC, Shri K. Ganeshan, Chairperson, SSWB, Smt. Ratna Kannan Municipal Councillors, PRI members and senior officers from the civil Administration and Defence establishment.